My husband and I have been eating 3 apricot kernels with each meal. They are bitter, but definitely palatable, especially when eaten with a few raisins or half of a dried apricot. Each serving of 3 kernels provides 30 mg of vitamin B17 (amygdalin/laetrile), for a total of 90 mg per day. While there is no recommended daily allowance (RDA) for B17, it has been suggested that a dose of 100 mg/day for adults is an effective cancer preventative. I read a recommendation by one nurse who said that children could eat a number of kernels per day equal to their age, up to a maximum of seven per day. Higher doses of B17 are recommended for those actively fighting cancer - as they say, an ounce of prevention is worth a pound of cure. The reviews on Amazon on the 1-lb and 2-lb bags are very insightful, and offer lots of other resources. And finally, please remember that I am not a doctor. Do you own research, and don't blindly follow any medical advice from anyone. It's bitter because it's cyanide, which is poisonous. It works in lab tests in dishes against cells, but the amount it would take to kill cancer in your body would end up killing you of cyanide poisoning first. Please do not give this to your children. My aunt almost killed her daughter this way, trying to treat her for cancer. She lived, but it caused CPS to get involved and she came close to losing her. Did you watch the film? It clearly and scientifically explains how and why the cyanide does not pose any danger, because it is only part of a molecule, and as such, bound and ineffective. The book goes into even more of the science of it. The following foods likewise contain cyanide: almonds, millet sprouts, lima beans, soy, spinach, bamboo shoots, and cassava. Additionally cyanide is found in most any fruits that have a pit, or core, like cherries, apricots, and apples. If there were a fire, you would not want to douse it in either hydrogen nor oxygen, as both would make the fire get much worse. However, together in the form of H2O, lo and behold, they put the fire out! Of course you can have too much of a good thing, which the film also explains. One should never eat more seeds than they would be willing to get from whole fruits. Eating 3 apricots at one time is very conceivable. But fifty? Not so much. Too much of ANYTHING can kill you. And if you think vitamins are dangerous, what do you think chemo, radiation, and surgery do to the human body??? The first two are known and admitted carcinogens. The 5-year survival rate of cancer patients is dismal at best, attesting to the fact that treating the symptom (tumors) does nothing to treat its cause. Nobody gets cancer from a lack of chemo or x-rays - they get cancer because their diet is lacking essential nutrients. Am I shocked that the medical establishment scoffs at this, or writes it off as unsafe? Hardly. At one time bloodletting (which is no more or less barbaric than surgically removing body parts with tumors) was commonplace. So was not washing hands between patients, and those who suggested otherwise were derided. Remember, there are lots of people making lots of money off cancer. They will never admit to any natural, readily available cure for cancer - what would they do with the billions and billions of dollars of equipment and facilities they have built up? It's their best cash cow. This is the life verse of the conventional cancer industry. God told us from the very beginning about seeds being for our eating ("meat" in the KJV was used as our word "food"). No further comments bringing up the false cyanide claims will be published - there is enough disinformation available online for those wishing to find it. Oh, and as far as the CPS claim goes - because we know they ONLY ever investigate bad people, right? Haha! Maybe your cousin almost died from her conventional treatment? I'm sure the doctor would readily admit that. I am curious as to your thoughts on all the cyanide reports. I'm assuming that's why you are only doing three per meal? These kernals are marketed as a cancer cure or preventative which seems great. I read a few different things about how most B vitamins have cyanide and many people take them everyday - I'm wondering about adding more to my daily vitamin intake. It is toxic to give peach and apricot pits to animals. It will kill them yet these are supposed to be fine to give to your children? Wow. 1) I am not giving them to my children. Learn to read. 2) If I did, there would be nothing wrong with it. 3) My dogs can't have chocolate. My chickens can't have peanuts. My kids eat both. What is your point? Are you saying your children are animals? Because mine are not. 4) Last idiotic comment published on this thread, I promise. You will never win. People are ignorant and will always foam at the mouth, even over apricot seeds!! Maybe they need an extra dose!! HA! We bought some awhile ago. I hate the taste! We actually gave our kids them. They had a hard time with the taste. I coated them with honey and that helped. I gave my bag to someone, need to get more. Thanks for sharing. Don't forget to feed your dog some of that B17 HAHAHHAHAHAHAHAHHA! So many people go off the deep end on this topic, due to the amount of misinformation circulating on the internet. My husband and I found out about vitamin B17 some time ago, and added bitter apricot kernels to our diet...though I must confess that I do not find them as palatable as you do *bleurgh*! Great post! My husband has colon cancer that has metastasized to his liver, lungs, adrenal gland and esophagus, thr later two places there is no other record of if going to which makes him a researchers dream at CCA. I thought I had read everything on fighting cancer through diet, but thsi is one is new to me. We fight cancer with both western medicene and diet, but I never make a diet change without first consulting with the the nutritionist at CCA. Can you tell me what the research is that supports eating the apricot kernels? I am open to new things, but i do have to make sure what I put into my husband's body is not more harmful than the cancer itself and so far cyinide isn't winning, but I do what to know all the facts. What do you think about people who have genetic mutations that give them cancer (like BRCA)? Would you say that is just due to nutrition? Well of course modern science mocks natural treatments! As I believe you pointed out earlier, there is no money from big pharma in things like vitamins. Even a doctor prescribing injectable B-12 for reasons other than weight loss is still considered controversial(at least in Atlanta and parts of North Carolina). And I would also love for someone to explain to me why there is such a shortage of B-12! While I believe there is a time and a place for modern medicine, I also firmly believe that if we stop and take the time to do the research, we will find that not only good nutrition but also natural supplements will make us much healthier. Didn't you post a documentary a while back about a doctor using that vitamin, Dr. Berzunsky? I know I must have butchered his name :( That was a very eye opening film. I also remember Kent Hovind talking about this in one of his online seminars..I need to look more into this for sure. Thanks for the reminder! When I was a young girl, my dad stopped at a farmer's market. I got a peach, my favorite at the time. I ate it in the car. Then I noticed the seed was split a little. I pryed it open and, excitedly said, "Dad, there's an ALMOND inside of a peach, did you know that?". Laetrile treatments, several decades ago, were seen as a natural treatment for cancer. I know of several people who desperately sought out these treatments, paid their money. And died. Healthy eating and good health habits (exercise, not smoking)obviously increase our odds for not getting cancer. Our genetics and environment also play a role. Our daughter's MD shared with us that he ate an organic, vegetarian diet and was a competitive athlete. It did not stop the colon cancer from killing him. TR;DR There is no magic bullet. Thanks, Zsuzsa. Nutrition is one issue on which I will actually listen to you (with verification). Wishing you & family good health. Philip Day at credence.org has great books on cancer prevention and alternative treatment too. It's a god idea to include many B-17 foods into your diet naturally such as lentils ,barley,spelt,blackberries,raspberries,tapioca(cassava),spinach..google it for more info.. Okay, I have a question. I did some research and decided to order a two pound bag. When it came, I promptly ripped it open and ate five kernels with dried apricots. No reaction. The next day for breakfast, I ate two kernels, and then for lunch, I had four. An hour later I promptly threw up everything in my stomach. Could I have been introducing them too fast? The flu has not been going around, and I had no fever. I was able to eat normally after that, but still felt nauseous the entire day. Since then, I have eaten only one per meal, with no side effects, although it is hard for me to choke down, since I threw a whole bunch up. Frankly, the thought of them now makes me gag. I will continue to eat them one by one until I build up my tolerance to them. I was wondering if you had had any side effects, like stomach issues. hi i just wanted to add to my last comment though i do see it hasn't been posted it yet...you may not have had time to look at it yet being busy with your 8 lovely children! apple seeds are also another food rich in B17. But one caveat is that he does promote NLP and lately real new agey cosmic concsiousness nonsense teaching so keep wide of all that but the scientific nutritional and health info is great..
My mother used to do this as well. She died last year. Metastastis from untreated breast cancer - untreated, because she was afraid of the chemo and she was convinced, that "it" will go away if she´s eating the right food. Unfortunately, it didn´t, it ate it´s way through her whole body and when she finally died, we were grateful for it. Grateful that she doesn´t have to suffer anymore, if she would have been an animal the doctors would have ended her life 6 months before. She suffered like an animal. Ironically, her cancer cells reacted very good to the chemo and her chemo would have been a very light one with nearly no side-effects. I learned my lesson the hard way: I eat healthy, I live healthy. But if I ever get cancer, I´ll get the full chemo asap. should read more and understand the mechanism of how it works in the body before they come and pollute this page with nonsense. Share you info it might help one in need. Karma will pay you back. Amazon.com has recently banned the sale of a number of items, including crocodile blood and apricot kernels. Crocodile blood sounds a tad far-fetched, but it’s a shame to see it grouped with apricot kernels. 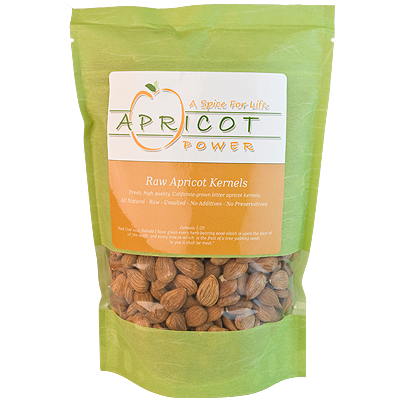 There is little question apricot kernels are a great benefit for many different forms of cancer. A Chinese study published as recently as last month found their extract to be highly effective against cervical cancer, both in vitro and in vivo. Despite this, apricot kernels remain under fire by regulatory authorities worldwide. Australia, for instance, appears to have banned the sale of raw apricot kernels as food. Different varieties have different levels of B17. Only those containing very small quantities of amygdalin can be sold for consumption and, sadly, they continue to be sold as therapeutic. But there are still raw apricot kernels being sold for "cosmetic" purposes that are rich and potent. Despite the warnings of potentially fatal side effects, there is virtually no evidence to support this concern, relatively speaking, which seems rather suspicious to those of us capable of intelligent research. Yes, one can find instances of excess consumption, but relative to the number of users, serious harm backed by medical document is nearly unheard of. The risk is little more than theoretical. Is this safe during pregnancy, I'm currently 7 weeks pregnant and was diagnosed with stage 2 breast cancer 4 weeks ago. I'm in desperate need of other resources other than the conventional chemo/ radiation. My Dr's are suggesting I terminate my pregnancy, which is not what I want to do. I need suggestions, please! I am so very sorry to hear! That must be a terrifying situation to be in. I will pray for your healing, and wisdom as you must navigate many medical decisions ahead of you. I have tried to get an answer on the safety of B17 during pregnancy from G. Edward Griffin, but have not gotten one. I would assume that it is at least as safe as chemotherapy and radiation. I know there are also topical B17 lotions on the market, maybe that's a better option for you. Many blessings to you and yours. Please keep me updated if you can. Hi Alex i only just saw your post. Hi hope everything is ok with you and ur family. There is a fb group called natural healing and cancer alternatives .it's a group ..if you are still looking for answers that might be a good place to ask. There is a book called mums not having chemo by laura something i cant remember right now. These might help. Cancer cures and natural research group is actually the exact name of the fb group. Is it safe adding them to my diet while breastfeeding?